I bought the Rosemary last year on a trip to Canada after going through many painful migraines and trying anything and everything to get rid of them. It has worked and I am so glad I was able to order another jar....I use it every night as a preventative measure and haven&apos;t had a migraine since I opened the jar for the first time last April. It&apos;s almost been a year without a single migraine. Thanks for your product. I tell everyone about it, even if they think I&apos;m CRAZY!...Don&apos;t ever stop making them. Jennifer G.
My 8-1/2 year-old daughter has suffered from migraines that last up to 6 days. She&apos;s had them since she was 3. She usually has one migraine every 2-5 months. We purchased the Rosemary oil and leave it open on her nightstand each night. She went for almost 9 months without a migraine. My mother, who suffers from monthly migraines, purchased the Rosemary oil. She has been able to "stop" migraines by sniffing the oil at the onset. She&apos;s been successful for several months now. We&apos;ve since had my mother-in-law and step-mom buy a jar. We&apos;ll wait & see how they do with the oil. Lynda J. My wife and I bought several of your products at the Los Angeles Fair last week and I am compelled to tell you what a wonderful product you have (but you already know that). I believe it was Bree who helped us. She is really a delight. A great salesperson, but your products do sell themselves. Your products have succeeded where so-called modern medicine has failed. Two of my wife&apos;s favorites are the Lavender and the Rosemary. The Lavender has helped her have a good night&apos;s sleep since I can&apos;t remember when and the Rosemary really does get rid of her headaches. As for me, I like the Mandarin. I have it open at my desk at work. I feel extremely energized and focused. I can&apos;t tell you how excited we are to have discovered the world of Aroma Sensations. You have a customer for life. 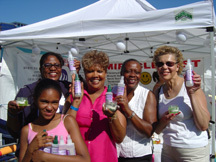 Faithfully, Greg E.
I purchased the Rosemary, Patchouli and Muscle Mist at the Home & Garden Show in Washington, DC. They all worked as promised. My hot flashes have decreased dramatically!!! And I don&apos;t have to take pain pills for my sprained knee. I love these products, have told some friends about them and am wondering what I would need to do to become a distributor of Aroma Sensations & Muscle Mist? Thanks and keep up the great work! Linda B. My name is Samantha Wright and my colleague, Lauren Takahashi, has turned me on to your product and it is a miracle all right! I am so impressed with your product. I get migraine headaches all the time and it ceases my headaches and makes me a much happier person. I am addicted to no end. It has helped and thank you for creating a product that really, really works. Keep doing what you are doing and thank you so much for making a product that has and will continue to save my life. Take care. * Thanks to my mom, my migraines are gone. * Came with a headache; left feeling great by smelling the Rosemary and a spray of the Muscle Mist on my neck and shoulders. Felt relief within 10 minutes. * Great!!! I will be back. * It really works !!!! !